The Early Palaeozoic brachiopod Dolerorthis. Brachiopods have a very long history of life on Earth (at least 550 million years). They first appear as fossils in rocks of earliest Cambrian age, and their descendants survive, albeit relatively rarely, in today's oceans and seas. They were particularly abundant during Palaeozoic times (248 to 545 million years ago), and are often the most common fossils in rocks of that age. Leptanena depressa, J Sowerby, 1824. Brachiopods are marine animals belonging to their own phylum of the animal kingdom, Brachiopoda. Modern brachiopods occupy a variety of sea-bed habitats ranging from the tropics to the cold waters of the Arctic and, especially, the Antarctic. Most live in the relatively stable environments below the low-water mark in sea water of normal salinity, but some have wide salinity tolerances and live in more marginal marine environments, though few can survive the turbulence of the intertidal zone. Although now relatively rare, they may be locally abundant because they tend to be gregarious. As with all animals, brachiopods are classified into species and genera whose names must be Latin words or words that have been latinised. The proper scientific name of a particular brachiopod consists of the name of the species, preceded by the name of the genus to which it belongs, plus the name of the first person to describe it and the date of that description. Brachiopods are virtually defenceless and their shell, enclosing the animal's organs, is their only protection. Most are permanently attached by a fleshy stalk (the pedicle) to a hard, sea-floor surface, such as a rock outcrop, boulder or some other shell, and are incapable of actively pursuing food. A few species can attach themselves directly to soft sediment and others remain unattached. The pedicle is the only soft tissue that protrudes outside the shell, which opens and closes to allow food-bearing currents of water to pass through it. The shell comprises two valves that are composed of calcite or chitinophosphate (calcium phosphate plus organic matter). The pedicle (or ventral) valve is typically externally convex. The other valve (the brachial or dorsal valve) may be similar but, in some brachiopods, it is extremely concave or more rarely conical. The main features of a brachiopod shell and hinge. Many brachiopods have their valves hinged together, typically by a pair of ventral teeth and dorsal sockets. The snugly fitting join between the two closed valves is called the commissure. The inner surface of the valves may bear various projections and depressions that reflect the location and form of organs or muscles that open and close the valves. The external surface may bear concentric growth lines, lamellae and wrinkles (rugae), ribs, folds, sulci and spines. An artist's impression of a Silurian seascape showing, on the right-hand side, clusters of Pentamerus (1) with other brachiopods, including Atrypa (2), as well as corals (3) and bryozoa (4). Atrypa also occurs amongst the brachiopod fauna shown in the deeper water on the left-hand side where crinoids (5) and gastropods (6) also live. Based on a painting by Richard Bell. The filter-feeding mechanism of a living brachiopod. The space between the two valves is divided into the body cavity (located at the posterior end) and the mantle cavity (located at the anterior end). Most of the mantle cavity is occupied by a fleshy, hollow organ (the lophophore), which has long twisted or coiled arms. Closely spaced filaments are suspended from the arms along their entire length such that they touch those of the adjacent coil and thereby form an enclosed mesh. Lateral cilia attached to the filaments beat rapidly, drawing in food-bearing water currents. The water currents carrying food particles (represented by the solid black arrows in the diagram) enter between the brachiopod valves through the lateral inhalant aperture. The food particles are caught in the mesh formed by the filaments on the lophophore arms. The filtered water (represented by the white arrows) leaves via the median exhalant aperture. The filter-feeding mechanism is one of the characteristic features of the phylum, and is responsible for much of the variation seen in brachiopod shell shape. Silicified brachiopod showing the brachidia etched out with acid, and filling the mantle cavity. Many species grow calcareous supports (brachidia) inside the mantle cavity to support the coiled arms of the lophophore, whose various shapes they mimic. Fossils rarely show indications of the lophophore but many groups show calcareous structures from the posterior end of the brachial valve. Knowledge of the internal features of the valves is needed as an aid to identification. Fossil brachiopods are useful tools for the geologist. They are generally robust and relatively abundant, and display considerable morphological diversity. In some Palaeozoic rocks that formed in shallow water, brachiopods are very abundant and may make up the bulk of the rock in which they occur. They provide an exceptionally rich record of almost the whole history of an animal phylum, and are therefore valuable in the study of evolutionary processes as well as in palaeoecology, palaeobiogeography and stratigraphy. They are particularly suitable for palaeoecological analyses because of their occurrence in different sedimentary facies. They lived on the sea floor where marine sedimentary rocks form. They were evidently susceptible to differences in environment as often recorded by the surrounding sediments. Their shell features reflect physiological differences relating to their way of life, and there are sufficient living brachiopods to provide useful evidence of functional morphology and lifestyle. They can also be useful stratigraphical indicators and tools for correlation in sedimentary rocks because certain lineages evolved relatively rapidly. With a basic knowledge of brachiopods, a keen observer can identify relative ages of strata to at least the level of period, especially in Palaeozoic rocks. More specialised knowledge is needed for Mesozoic rocks because Mesozoic-aged brachiopods show less external morphological diversity and are relatively rare. Influenced by such factors as water depth, salinity, oxygen levels and static lifestyle, the distribution patterns of fossil brachiopods provide a useful tool in deducing the position of ancient shorelines and the past distribution of land and sea. Cambrian rocks characteristically contain a diverse and abundant brachiopod fauna, at first completely dominated by chitinophosphatic species but later joined by various calcite-shelled forms. These prelude a dramatic diversification such that brachiopods, together with trilobites, are the primary stratigraphical guide fossils in the shallow-water facies of the Ordovician; they are also important in the Silurian and Devonian. In the Carboniferous, they have been of some stratigraphical value, especially at a local level, when combined with corals. Many major groups of brachiopods became extinct at the end of the Palaeozoic. In the Mesozoic and Cainozoic eras, the phylum was much less diverse and no longer dominated the shelly faunas. However, brachiopods give their names to a number of zones and marker beds, particularly in the Jurassic. 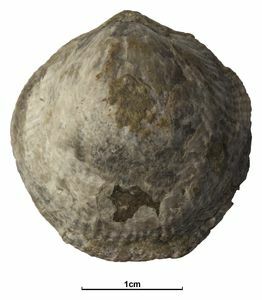 The youngest well known brachiopod from British rocks is Terebratula maxima, a large terebratulid from the Neogene Coralline Crag of East Anglia. Map showing the main areas of Cambrian to Neogene sedimentary rocks in Britain. Colours correspond with those shown in the geological column. The main divisions of Earth history in which brachiopods have lived, showing the relative diversity of the phylum through time. Maximum diversity is seen in the Devonian. Terebratulina lata, Etheridge, 1881 gives its name to a zone in the Turonian (Late Cretaceous). Torquirhynchia inconstans, J Sowerby, 1821, gives its name to a marker bed in the Kimmeridgian (Late Jurassic). Goniorhynchia boueti, Davidson, 1852, gives its name to a marker bed in the Bathonian (Mid Jurassic). Brachiopods are popularly known as lamp-shells because of the similarity of some forms, particularly terebratulids when inverted from their growth position, to early Roman oil lamps. The genus Lingula has survived virtually unchanged from the Cambrian to the present day. Natural History Museum. The genus Lingula has survived virtually unchanged from the Cambrian to the present day. Unlike most brachiopods, it lives successfully in brackish water environments such as tidal mud flats. Lingula uses its pedicle to move up and down in the vertical burrow in which it lives. The pedicles of Lingula are a delicacy in some Asian countries, and are known as 'lamp shells'. In the Silurian rocks of Shropshire, unusually preserved Pentamerus oblongus have led to the rock in which they occur being called 'government rock'. Here, the original shell material of the brachiopods has dissolved away leaving only internal and external moulds. Where shell structures relating to muscle attachment inside the pedicle valve have disappeared, the moulds are characterised by arrow-like slits like the symbol used for government bench-marks and on prison uniforms. The brachipod Cyrtospirifer verneuili, from slates of Late Devonian age near Delabole in Cornwall, is known as the Delabole butterfly. Natural History Museum. Other brachiopods have been likened to butterflies and birds. In particular, the brachiopod Cyrtospirifer verneuili, from slates of Late Devonian age near Delabole in Cornwall, is known as the 'Delabole butterfly'. The naturally wide hinge-line of Cyrtospirifer has been distorted and widened further by the pressures in the Earth's crust that led to the formation of the slates themselves. Similar, but undeformed, wide-hinged spiriferid brachiopods have been likened to birds. For example, in China, the common name of such forms translates as 'stone swallows'. There, they are boiled in water with various herbs to produce medicinal potions and powders. In parts of the Jura Mountains in central Europe, certain rhynchonellid brachiopods are known as 'little doves'. Brachiopods vary considerably in size. The aptly named Carboniferous genus Gigantoproductus may grow up to 30 centimetres across. In contrast, the Jurassic rhynchonellid genus Nannirhynchia is minute, generally only two or three millimetres across, or the size of a large pin head. Load 3D model (SM A 11629 — holotype). Find out more about this fossil.